Your house on the lake is a one level ranch style duplex home. The 2 bedrooms are fully furnished and no need to bring linens. We have everything you need right here. Including 3 kayaks and life vests for your use. There is off-street parking for 2 cars. This rental is the back half of the house behind Houseworks Realty. From the apartment, walk out the sliding glass door off the spacious living room/kitchen and enjoy the huge 30 x 10 deck with table, umbrella, chairs/lounges, and propane gas grill. A few steps down brings you to the backyard with beach and dock. Go swimming, fishing, bring your boat, Jet Ski, or sailboat and tie up at the house. Lake Lashaway is a full recreational lake. There is a public boat ramp on the lake. Our rental sleeps 4 and has 2 Bedrooms (1 king, 1 queen), approximately 1000 sq ft. We have a washer & dryer in the unit for your use, a large kitchen (cooking utensils provided), refrigerator, microwave, dishwasher, electric range, under-counter TV with CD & DVD player. The living Room amenities include leather reclining couch & leather reclining chair, flat screen TV & DVD player and large sliders to deck overhanging beautiful Lake Lashaway. You will LOVE relaxing on our over-sized deck and the gorgeous sunsets! Both bedrooms have flat screen TV's. We are close to the Brimfield Flea Market, orchards, golfing, Sturbridge Village. Walking distance: 1 block walk to 308 Lakeside which is a fine dining restaurant on the lake, a cute breakfast place next door, a pizza place across the street as well as a bar with live music 4 nights a week, a country store with beer and wine and the post office. There are also summer concerts on Thursday within walking distance. 4 night minimum. Summer is a great time to visit with fishing, boating, jet skiing, swimming, kayaking/canoeing and more! We have a dock so you can bring your boat for your enjoyment. The fall is also a beautiful time to visit to view the foliage. Lake Lashaway a fully recreational lake that is 293 acres. The average depth is 10 feet (3.05 m) with the maximum depth about 18 feet (5.49 m). The water is brown in color and quite warm in the summertime. Numerous houses and cabins line the shore, being a summertime retreat for many, and full-time residences for others. There is a public boat ramp so feel free to bring your boat or jet skis. If you love to fish, Lake Lashaway offers good fishing for many warm water fish. A survey conducted in 1994 showed thirteen species including Large and Small-mouth Bass, Chain Pickerel, Yellow Perch, White Perch, Black Crappie, Bluegill, Pumpkinseed, Brown and Yellow Bullhead, Golden Shiner, and Sucker. The lake was stocked with Northern Pike in the past. Cliff and Cindy are local real estate experts in the Brookfields and surrounding towns. We own our own real estate office and have been in the business since 2000. We have been a couple for 20+ years and got married in 2009. We have lived in the area our entire lives. Cliff graduated from UMass Lowell and Cindy graduated from Quinsigamond Community College. Both with degrees in Business Management. We bought this property because we love to travel and unwind. This home provided us an opportunity to be close to everything and run our business from home, being it is a downtown location, while having the luxury of lakeside living. We enjoy having restaurants next door and across the street as well as a small bar that plays live music. There are also churches, golf, bowling, grocery stores, farmer's market, etc. within minutes of our home. It was the perfect location for us. Our home directly overhangs the water. You don't have to walk far to be relaxing by the beach. You can walk to local restaurants and bars which are across the street and next door. You can also walk to the town beach which is less than a mile away. Sitting out on the deck in the evening with a nice glass of wine watching the sunset is always a favorite of ours and our guests. The views are amazing! We do have a beach to sit and relax on and put your toes in the water if you don't want to swim. A lot of houses on the lake do not have an actual sandy area. We do! Full bathroom with tub/shower. Front load washer and dryer. Hair dryer in drawer in bathroom. Laundry soap and bleach provided. 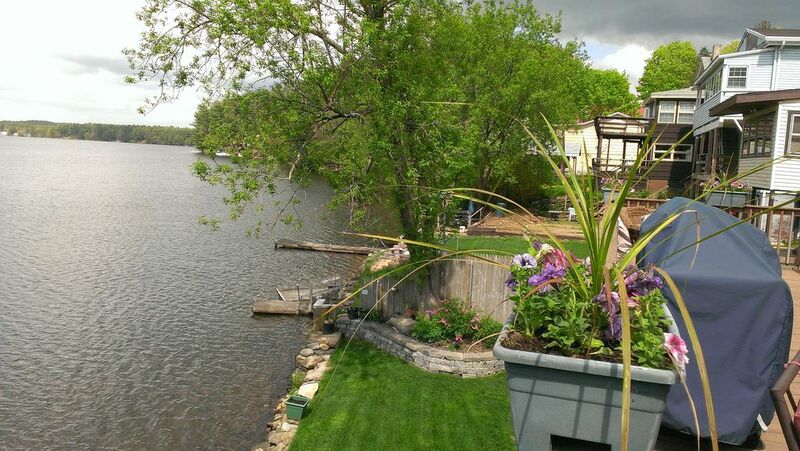 Enjoy the scenic views from our 30x10 deck which literally overhangs Lake Lashaway! Very comfortable leather reclining couch with molded seats and one leather chair. Flat screen TV and dvd player. We have lots of movies in the entertainment center for your use. We have an xbox in the apartment. If you want games just ask what we have. It's an older system. We have 2 kayaks for renter's use with life jackets and paddles. This home is not baby proofed. Children over the age of 6 preferred due to high stone walls and safety. Internet is for entertainment purposes only. It is reliable, but not guaranteed. While we strive to have everything in running order, unfortunately equipment failures do happen and cannot always be controlled. If this happens we will work to have it up and running and soon as possible. Very charming place to stay. The lake view is awesome! The house had everything you could possibly need, a true home away from home and it was spotless! Cindy was very helpful in helping us get settled in and could not have been nicer. Although the property is on a main street, you do not hear the traffic at all in the house and what you can hear on the deck is minimal. The house is also within walking distance to several places to eat which was really convenient, although I could have cooked a gourmet meal with how well the kitchen was stocked. We really enjoyed our stay and if we ever want to return to the Brimfield Flea Maket, we would definitely stay here again. Thanks for everything! Beautiful location. Apartment immaculate and in great condition. We enjoyed our stay immensely. We enjoyed the peacefullness of the lake and the comforts and amenities of the house. We had everything we needed. It was great! Thank you for your wonderful review. We are so pleased you enjoyed yourselves. You had a wonderful week at the lake with the weather. Hopefully we'll see you again in the future!! The lake was beautiful. Cindy and Cliff were very friendly and helpful. Lovely place to spend your long weekend with family or friends. This was our third time staying there, the view of the lake is wonderful and peaceful, close to any and all attractions in the area. The owners are on site and friendly and helpful, they make sure you are welcome and comfortable. We can't wait to see you again next year. We can highly recommend the appartment. The kitchen has all you need for cooking, the beds are comfortable. The appartment is very clean and we loved it to be there. All the time we went to the windows for to look over the lake. It was so beautiful. And if you like to swim, it is perfect. Only a few steps and you are in the water. Thanks so much, Cindy and Cliff. If it would be possible in the future we will come back. Our Waterfront rental is located in a beautiful sunny spot. Perfect for viewing the amazing sunsets on our large 30' x 10' deck. You will love the magnificent views of the lake. This is a 293 acre, full recreational lake. There is a public boat ramp and we have a dock to moor at. The fall is also a beautiful time to visit for the foliage, apple picking, and antique fair in Brimfield. There is a man who does hot air balloon rides over the lake, too. We have 3 kayaks for renter use. We are also close to the Brimfield Antique Show if you are looking for lodging. Bring your boat, jet ski, fishing boat, whatever and have a blast!! We are also located in the downtown which is a quaint area with a breakfast/lunch spot next door, a pizza place across the street and a bar with live music on some nights across the street and a waterfront restaurant with an outdoor eating area just a few doors east of us. The town beach is less than 1 mile from the house if want a larger beach area than what is at the house. Golfing and bowling are close by as well as apple orchards and shopping. Golf: Baypath Golf Course is right around the corner on Rte 67 heading towards North Brookfield. There is also Leicester Country Club in Leicester. No pets. Non smokers only. No more than 4 guests.